﻿ Best Price on ​Delluz Bahia Encantada in Jaco + Reviews! 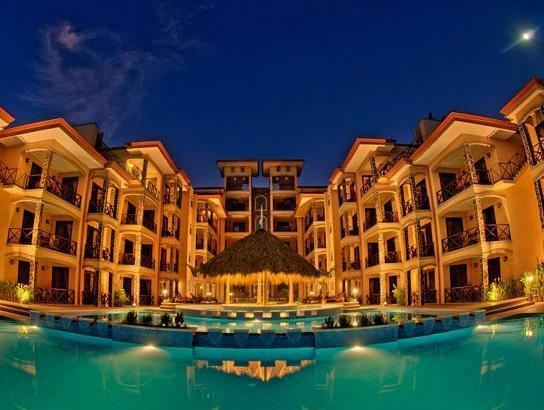 This boutique hotel has direct access to Jacó Beach, on Costa Rica’s Pacific Coast. It offers a large outdoor pool and stylish apartments with free Wi-Fi, a flat-screen TV and a private balcony. The air conditioned apartments at Oceans Bahía Encantada feature tiled floors and luxury, colonial-style décor. There is a sitting area with cable TV, and the modern kitchens have a stove top, coffee-maker and dishwasher. The Bahía Encantada organizes a range of activities, including rafting, 4x4 trips and a jungle canopy tour. The hotel also offers massage services upon request. Surfing classes are also available. The center of Jacó is just a 10-minute walk away. The hotel offers a shuttle service to Juan Santamaría Airport, a 1 hour and 15 minute drive away. Please note that check-in takes place at Oceans Center, on Main Pastor Diaz Avenue, next to Jaco Park. Opening hours are as follows: Monday - Saturday 08:00 - 22:00 Sunday 08:00 - 17:00 Please note that American Express is not accepted as a form of payment.